Not all war memorials are monumental or made from marble. While I was reading Ann Beaglehole’s Eastbourne: A History of the Eastern Bays of Wellington Harbour, I discovered details of trees planted by the community to remember World War One (WWI) and those who lost their lives. In July 1916 two pohutukawa trees were planted on the corner of Oroua and Rata Streets to mark the landing of Anzac troops at Gallipoli. The one tree that survived became known as Eastbourne’s Anzac Memorial Tree, and is regarded as the oldest Gallipoli memorial in New Zealand. Eastbourne’s Anzac Memorial Tree on the corner of Rata and Oroua Streets. Photograph by Michael Fitzgerald, 13 April 2008. 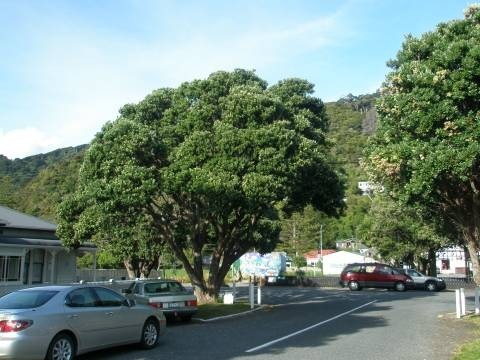 Two other memorial trees – kauri – were planted in private gardens in nearby Nikau Street, to mark the deaths of local men. One was for Second Lieutenant Harry Oswald Furlong Marsden, killed in action in October 1917 during the Battle of Broodsiende, in Belgium, part of the Passchendaele offensive. The other memorial kauri tree was planted for Sergeant Hubert Earle Girdlestone. He lost his life in August 1918 during the Battle of Bapaume, in France. The battle was part of the successful initiative that broke through the German trench system. EDIT: This project is now closed. Hi Adele I also wonder if there is anything in the newspapers that would come up in a search on ‘Papers Past’ about the trees? GREYTOWN SOLDIERS.. sadly couldnt find even one soldiers name on any of the trees in the park yesterday, but, later today, will list the names on the gates.. WW1 soldiers, took photographs of this as well..
Soldier’s Memorial.. Greytown. South Wairarapa, This beautiful park was once part of the 40 acre farm block bought by Hugh O”Connor in 1856. In 1920 the local Greytown Community raised and dedicated a Memorial to those who fought and died in the First World War. The 57 Lime Trees (Tilia eurpaea) were planted to commorate the servicemen who died. Taken from Heritage Tree Trail of Historic Greytown. Eric Pawson, ‘The memorial oaks of North Otago: A commemorative landscape’, in G. Kearsley and B. Fitzharris, eds, Glimpses of a Gaian World. Essays in Honour of Peter Holland, University of Otago, 2004, pp. 115-31.
not sure, but will have to check with Masterton Archives, Norman Avenue some one said the trees there were a memorial as well.. oak trees.. just off SH2 north of Clareville. There is a TREE lined road near Gladstone. Wairarapa in memory of soldiers. Also I believe some at nearby Greytown.. Yes they do – Anzac Ave is beautiful to walk or drive down. It would be great if you could take some photos of (either of) these and post them onto the World War One Memorials Project on flickr – see above to click directly through to it. Oamaru has memorial oaks ( I think) planted along the southern entry to the town, and Dunedin’s Anzac Ave has memorial trees as well.